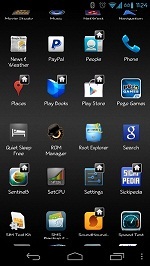 Rom manager is designed to make your life easier with your rooted phone.Â It works by enabling you to flash (install) a custom recovery to your phone without needing to push it through adb or using the computer. There are 2 options in the play store for rom manager, the free version or the premium version.Â Free is good, premium is better, not only are you supporting the developer but there are also options in premium that you dont get in the free version, including premium roms to download. Using rom manager is fairly straightforward, once you've installed the app you open it and are presented with a few options.Â The first one you want to use is â€œflash clockworkmod recoveryâ€, this will then prompt you to confirm your phone version (on mine it asks if iâ€™ve got the GSM version or the CDMA version of the galaxy nexus). Once you confirm this then rom manager does its thing and installs the clockworkmod recovery (this will work on a mobile data signal but its better to use a wifi signal just in case of a signal loss). Once you've flashed the recovery the next thing you should do is create a backup of your phone. This means that if anything goes wrong you can restore back to whatever state your phone was in the second before you backed up. 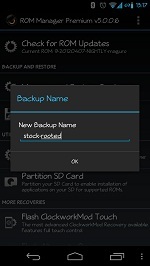 When you click the backup rom option a pop up gives you the option to name your backup file. I generally don't bother unless it's the first one on a new phone then i name that â€œstock rootedâ€. I know that i can return my phone to its out of the box just been rooted state if i ever need to! This backup process can take a while, mine usually takes around 10 minutes and itâ€™s quite harsh on the battery so make sure youâ€™ve got over 50% powerÂ remaining before you start. I have done it on less than 30% but I wouldn't recommend it just in case the battery dies mid back-up. Right so weâ€™ve got our recovery flashed and weâ€™ve backed the phone up so what can we do now..
One of the nicest things about rom manager is that it gives you the ability to download a rom through the app to flash onto your phone then flash it from the app, instead of downloading it to your pc and then putting it on your sd card via a usb cable. Again, Iâ€™d recommend using wifi instead of mobile data to do this, but this time purely because of the size of some of the roms. If you're on unlimited data then feel free if not use wifi. You then select the option you want and you get another screen with stars on it. At the bottom of the screen are 3 buttons for download, comment and cancel. Click the download one and your rom will start to download. While you wait for your download you can carry on with whatever you want to do, but iâ€™d recommend using titanium backup to backup your apps and another app to backup your texts.Â Don't be surprised if this download takes a while as the old saying goes â€œgood things come to those who waitâ€. Once your new rom has downloaded youâ€™ll see a pop up box like the one shown. Iâ€™d recommend clicking both the un-ticked options to backup the current rom and to wipe all the data and cache. This gives you a better chance of everything going smoothly, but does mean that all your data will be wiped from the phone (apps texts emails.......you did back it all up didn't you???). Once you've clicked ok your phone will boot itself into recovery and perform the backup/wipe/install new rom. Of course this is just the automated side of rom manager, there are lots of options for manual control too including management and restoration of backups. This does exactly what it says on the tin and once your happy with the settings you can delete some of your backups (as you can see iâ€™ve not deleted any for a while!). Another option is to fix permissions. This can help if you're having problems with apps force closing on you, but most of the time if you wiped your data and cache before installing your rom then re-installed your app backup, you won't need to use this option. The last option to mention is the partition sd card option.Â This will give you ext 3 and 4 partitions on your sd card if you need them for a rom, but remember to backup your sd card to your pc before you do anything in here because it will wipe your sd card clean. So there you go a quick(ish) guide to rom manager!